Have you received a Start Up Loan (or other funding)? No, but Perry received a Start-Up Loan when he launched Tidi-Cable Limited in 2013. What university (if any) did you attend? Perry went to Loughborough University. The plant-based approach to nutrition grows in popularity every year and, with the likes of Lewis Hamilton, Liam Hemsworth and Ariana Grande endorsing the virtues of veganism, it looks like it’s more than just a passing fad. 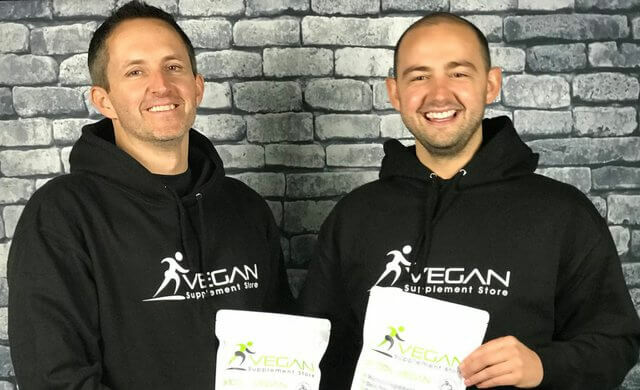 Making ethical gains in the business world after launching their 100% vegan sports supplement range, the Vegan Supplement Store’s founders share their business-bulking story. We provide a range of great-tasting vegan sports supplements and meal replacements, designed to support anyone following an active lifestyle or a plant-based diet. We support our products with useful information to help our customers achieve their health and fitness goals. We have both been users of protein supplements for some time and Perry has been vegan for a number of years. David found that whey protein left him feeling bloated and neither of us liked the flavour of the vegan protein powders that were available at the time, so we decided to create our own. We did a lot of market research by analysing Google Trends, competitor website traffic and social media engagement. We also looked at stockists of similar products and we asked friends and family for their views. We then looked at the investments going into vegan products around the globe and we reviewed the Mintel market research and we were convinced that this was something we should pursue. Perry was running Tidi-Cable Limited and was a director of Crunchposter (another Start Up Loans funded business). David was Chief Marketing Officer at the Start Up Loans Company, helping other aspiring entrepreneurs achieve their business ambitions. David: “I had my own business in 2003, offering marketing and PR services, but I didn’t have clue how to run a business back then, so I went back into employment after a couple of years. Ever since then I have been focusing on my career and became Chief Marketing Officer for The Start Up Loans Company (SULCo) in 2015. Seeing all those businesses generating great ideas and having the bravery to go it alone really inspired me and I guess I caught the bug again. We raised the money from our own savings. We work with a UK manufacturer to produce our range of products and we currently only sell them through our website, although we are talking to other distributors at the moment. It sounds cliché, but starting a business really is tough and it seems at times that anything we try to do takes two or three times longer to deliver than we anticipate. Getting the labelling for the products right was the most challenging part of the project. With such a wide range (seven products and six flavours) we had a real task ensuring they were accurate and compliant, but thankfully we worked with a great company to ensure everything was top-notch. Our online store is built on the Shopify platform, which is great because of the convenience and flexibility, but even more so is the cash-register sound that your phone makes when the Shopify app detects a new purchase – it makes us smile every single time. Never stop learning and taking advice. Every single day we are teaching ourselves new skills, from designing to coding and learning how to leverage the vast array of tools that are available to support small businesses. Without a good strong network to provide advice and support we most definitely would not have achieved what we have to date. It has been humbling to see how generous people can be with their time and even their resources when they know they are helping you to achieve something positive. We are already quite unique in our position in the market (100% vegan, offering a wide range of sports supplements and meal replacements), but we want to secure that position and be seen as the go-to place for vegan nutrition products, information and advice. We also have a number of other business ventures we are keen to pursue when time allows. This launch is helping us to develop the skills and frameworks we will need to make them a reality.